Meet Jane and Joe. Both are in their late 40s, employed, and married with kids. They both have high blood pressure and have been told by their doctor to quit smoking and lose 20 lbs. 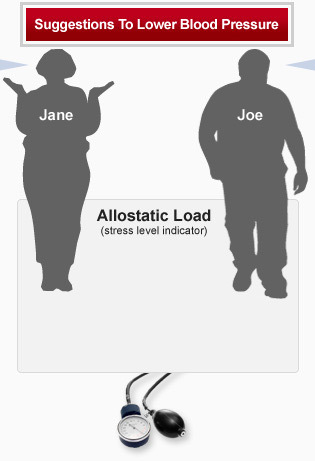 Click on the suggestions below to follow Jane and Joe as they try to lead healthier lives. How are their choices limited by the conditions in which they live? Read the conclusion for policy ideas that can help all of us. “I'm Jane and my doctor told me I need to lower my blood pressure. It's not going to be easy. I'm a division manager for a shipping company. I supervise 25 others. It’s definitely challenging sometimes. There's a lot of pressure to meet deadlines and hit sales targets but I’m fortunate to have some control, I guess. My husband works at the same company. We get good benefits but you know, there's been talk of downsizing so that's always a worry. “I'm Joe and my doctor told me my blood pressure is too high. My work keeps my blood pressure high. I've been driving an airport van for 12 years. I work 5-6 shifts a week, all hours of the day and night. It pays decent, but they change my schedule every couple weeks. It's tough on the body getting up early one week, working late the next. Rush hour is the worst – gotta stay on schedule no matter the traffic. My wife and kids make do when I'm not around, but I worry about them going outside, especially at night. Our neighborhood can be a little rough.